This is one of those functions that could be done but it was clunky and manual. I had used it in a number of databases but was never happy with it. This is what I was trying to do. In Access, open Outlook and create an Email. 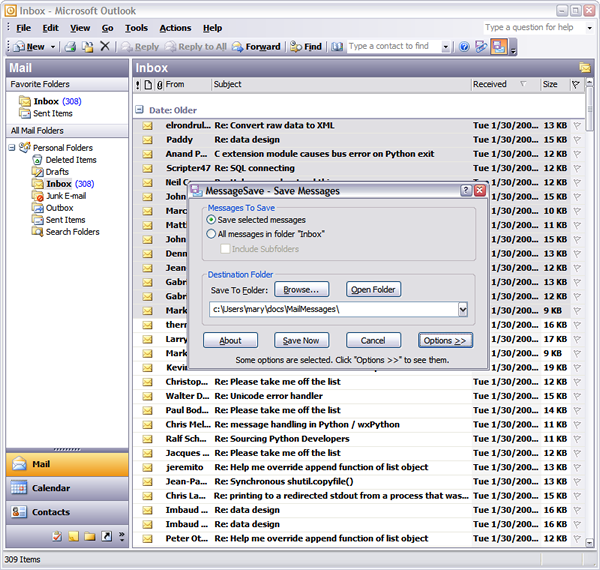 Send it, then create a file of the sent Email. I had used .MSG format or .PDF. All required manual steps. The file was saved and then a link created to it in an Access table. Recently while creating a customer relationship management system, I had a need to do just that. I had a button to open Microsoft Word, transfer some name and address details into a new Word document and store the path to the saved document in Access. Excel was not much different. When it came to Emails, I was doing some web surfing and found a product called MessageSave. By using MessageSave, and building a bit of infrastructure I can now achieve the result without a problem. You can download a sample Access 2007 database by clicking here. To get it to work will require you to download and configure MessageSave but a 30 day trial is available. "Easily save Email messages outside of Outlook. 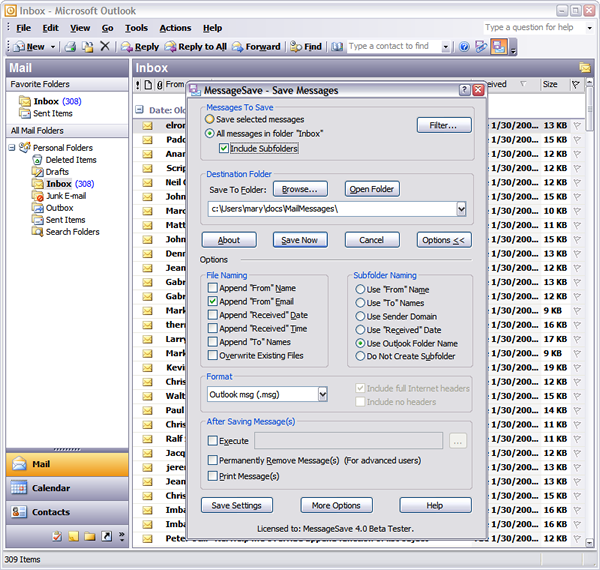 Use MessageSave for Email. archiving, backup, document management, sharing, legal compliance, and much more." All for the total cost of US$49.95 per license. Here are some screen shots. This shows the pop up message to prompt you to save the Email. There are many options you can use to configure the software. The key part for Access developers is that it uses an API to output some information. 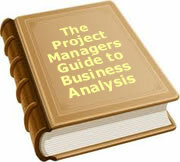 In Access we create a table called tblDocuments. It has a field called DocLink which is a hyperlink to a document. Here are the key steps in the process. When the Email. is sent, MessageSave prompts to save the Email. and handles selection of a location and file name. When saved it calls a VBScript to execute. The VBScript writes the saved Email. file name into a one line temporary text file. Access reads the temporary file After the Email. is sent, control returns to Access. It reads the temporary file and writes the file name to the DocLink field in tblDocuments. It also does some housekeeping such as deleting the temporary file. There is a form that collects To, Subject and Body. You can use it or not. I included it to show how it could be used to transfer information to Outlook but you could just have a button on a form that opened a blank Email. The first part is the establishment of the name and path of the temporary file. It is called temp.txt and is in the same location as the database. I use a generic routine funGetDBPath to find the current path. Public strFileName As String ' The temporary text file that stores the location of the saved Email. The next section sends the email and writes to the table. There are a number of subroutines. One part that may need explanation is the creation of the hyperlink. An Access hyperlink is in two parts at least, separated by a #. The first part is what is displayed and the second the path to the file. I have just used the same for both parts.
" VALUES(#" & Format(Now(), "mm/dd/yyyy") & "#, """ & strLineTextFile & """);"
Set qdf = dbs.CreateQueryDef("", strSQL) ' Create new QueryDef. There are a number of enhancements you can make. For example you can save other information to the document table, or pass a form field into the internet. This is the basic function to get you started. 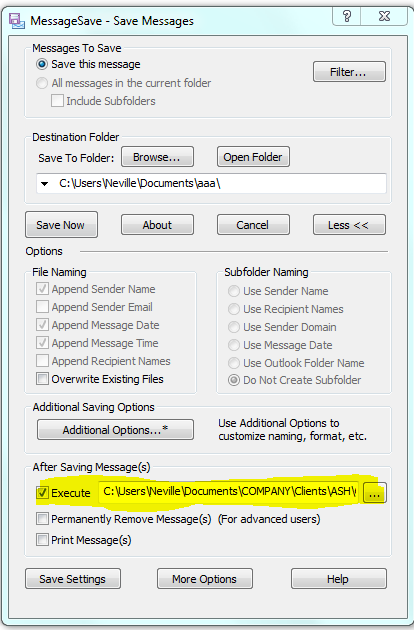 If you want to store received emails we have a similar function in the sample database to open Outlook. Use MessageSave to save the email from your Inbox, then Access will store the details. The key thing in the configuration is to set the After Saving Messages, Execute field to point to the VBScript file in the download. This creates the temporary text file. 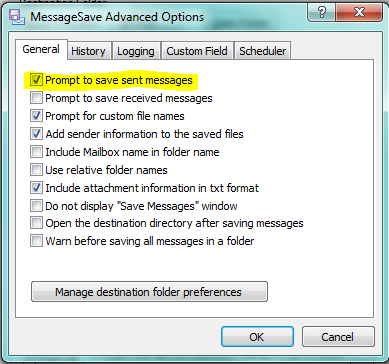 The othe piece of critical configuration is to select the Prompt to save sent messages.